Potato salad is the ultimate summer food. You can whip it up and take it to BBQ’s or just relax on your porch and enjoy the delicious flavors and aromas of this dish. I love tahini sauce and I wanted to make a dish using it as one of the main ingredients. I made this savory potato salad using organic potatoes and mixed greens as the base. It turned out completely scrumptious and I can’t wait to share it with you! Steam your kale and spinach leaves for 7-10 minutes or until the leaves are bright green. Set aside in a large bowl. Cut up your potatoes in small pieces and steam them until you can stick a fork through the pieces. If you prefer to peel your potatoes, that is fine but it’s not necessary. Cut up the 2 cloves of fresh garlic into tiny pieces and add to your steamed mixed greens in the bowl. Cut up the mixed greens and toss with the fresh garlic. 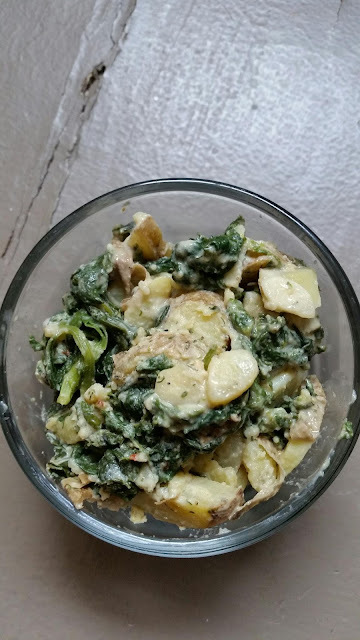 When the potatoes are done, add them to the large bowl and add the mustard and tahini sauce and mix well, making sure all the greens and potatoes are coated with sauce. Add the spices and mix well again. Serve with veggies burgers or other dishes or polish off the potato salad yourself! Double the above portions if you are making this for many people. There is no need to add salt to this recipe as the tahini sauce and spices make it savory enough. To make a lower fat version, use just 1 tbsp of tahini sauce. If you love this recipe and want more delivered right to your inbox, click here to sign up!